The sun occupies the same position in the sky today as it did in 1900 and 1901, which helped Thornes figure out the time of day. Monet also included another London landmark, the obelisk known as Cleopatra’s Needle, in some of his paintings of Charing Cross Bridge. Thornes says that examining the position of the needle relative to the bridge helped him determine that Monet stayed in rooms 610 and 611 at the Savoy during the winter of 1899, and one floor down at 510 and 511 a year later. “The Savoy Hotel actually advertises the Monet Suite, which they sell to the public,” Thornes says. “And they in fact use the suite farther down from where Monet actually was.” But, says Thornes, the hotel is under renovation, and when it reopens, it will have the correct rooms designated as the Monet Suite — thanks in part to his research. 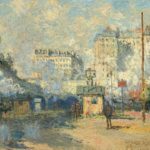 Monet’s images of London aren’t just great art. Thornes says they also provide an accurate record of the city’s notorious “pea-souper fogs,” common in the days before clean-air legislation was passed in the 1950s.